The best places to buy rental property for cash flow and equity growth often have three things in common: job growth, population growth and affordability. When you find a market that has all three of these factors, you’ll probably be able to find good investment opportunities. There are several cities across the United States where these factors exist today — places where you can buy high cash flow rental property while prices are still low (around $100,000 in many cases), and watch your equity grow. In this article you’ll learn about 18 of these “best-buy” real estate markets for the year 2019. 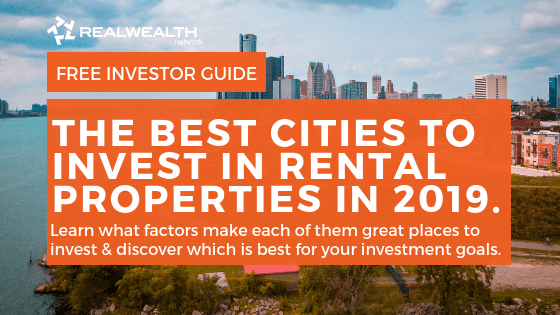 Find out what makes them great places to invest and why. Note: These markets are not listed in any particular order. Click to to read by section. The demand for single family homes has been on the rise in the Sunshine State for quite some time. Still, it’s possible to acquire fully renovated properties in good Florida neighborhoods for under $157,000. What’s even more interesting is that, despite these incredibly low housing prices statewide, many home seekers are choosing to rent instead of buy. As you can imagine, this is causing rental rates to skyrocket (7% in just a year) and is expected to keep increasing in 2019. On top of great cash flow, values are on an upswing in these areas with no sign of slowing down. They are nowhere near their 2006 highs and inventory levels are still way down because builders just can’t make a profit at these price points. Property taxes and insurance are low, plus there’s no state income tax. Add warm weather and exceptional health care, and you can see why many of the 10,000 baby boomers retiring every day are moving to Florida. 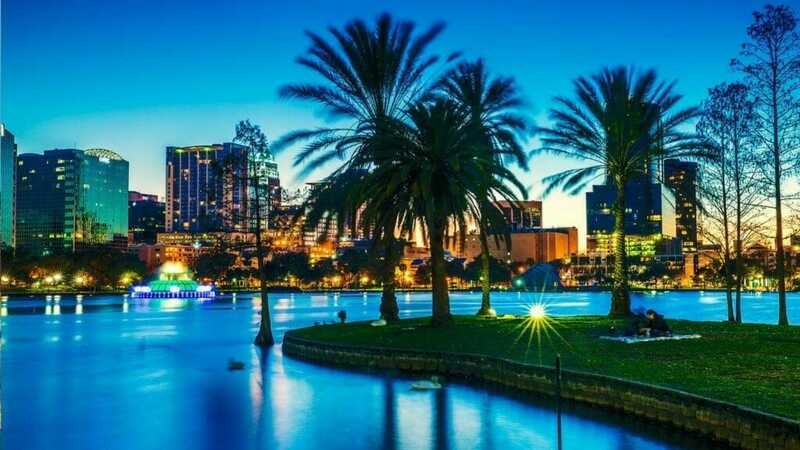 Orlando is one of the best places to buy rental property in the state of Florida in 2019. Located in Florida’s “sun belt” region, the area is known for its warm climate, beautiful beaches, world famous amusement parks, entertainment, and attractions. 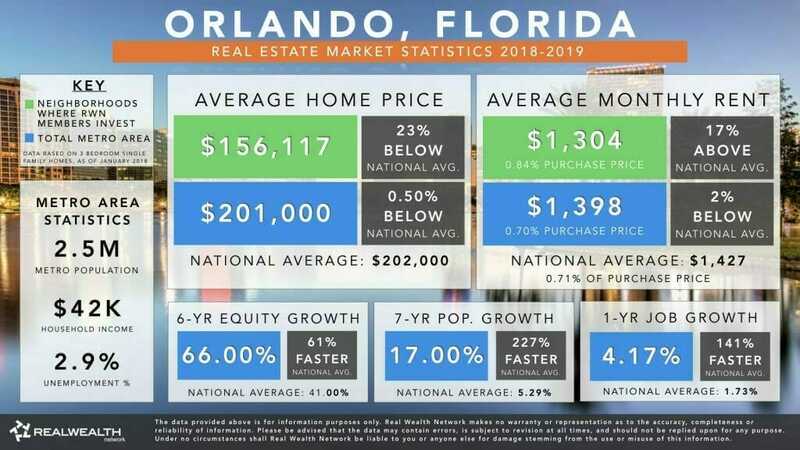 With a growing population of over 2.5 million residents, the Orlando real estate market is fueled by job seekers, baby boomer retirees, and students who want to live in a “cheap and cheerful” area that offers a high quality of living at a reasonable cost. Orlando is listed as the #1 Best Places to Buy a House by Forbes for the second year in a row. Projections suggest up to a 35% increase in house prices by 2021. Metro Orlando is the 4th largest metro area in the country, and it’s also the 16th fastest growing metro in the nation. Forbes reports that 60 million people visited the Orlando area in 2015, making it the most visited tourism destination in the country. The population in Orlando has grown 36% since the year 2000. To date Metro Orlando houses over 2.5 million residents. Rents grew by 2.49% in the last 12 months, which is 17% higher than the national levels. Orlando’s projected job growth for the next ten years is the second-highest (3.2% annual growth) in the United States among the 200 largest metros, Forbes reports. Job Growth: Orlando’s employment growth is among the best in the U.S. with more than 52,000 new jobs created in just a year and a projected growth rate of 3.2% annually for the next ten years. Affordability: In Orlando it is still possible to purchase fully renovated 3-bedroom properties in good neighborhoods for as little as $156,117. Located on the west coast of Florida, Tampa Bay is a densely populated metropolitan area (second only to Miami), with a population of more than 3 million people. Major cities in this area include St. Petersburg, Largo, Clearwater, New Port Richey, Holiday and Tampa. The local economy is worth over $130 billion and the metro area has been ranked as one of the top 20 fastest growing in the country. Tampa also has a strong local economy with a strong focus on job growth in areas such as financial services and healthcare. The Greater Tampa Bay area has created approximately 30,000 new jobs in just 12 months, with a job growth rate 18.32% above the national average. More than 19 firms with annual revenues of more than $1 billion are headquartered here and it is home to four Fortune 500 companies. Tampa and surrounding areas continue to be some of the best real estate markets in the country. Tampa has a population of 4 million, a local economy worth over $130 billion, and it’s ranked in the top 20 fastest growing metros in the United States. An area with mostly high-priced homes, Tampa still has pockets where investors can find homes at affordable prices (even as low as $120,000) and turn around to rent them for $1,075 a month to $1,400 a month. New jobs from Amazon and a talent pipeline from the University of South Florida helped push the Tampa metropolitan area to the No. 15 spot on the Milken Institute’s 2018 index of best-performing cities in the United States. 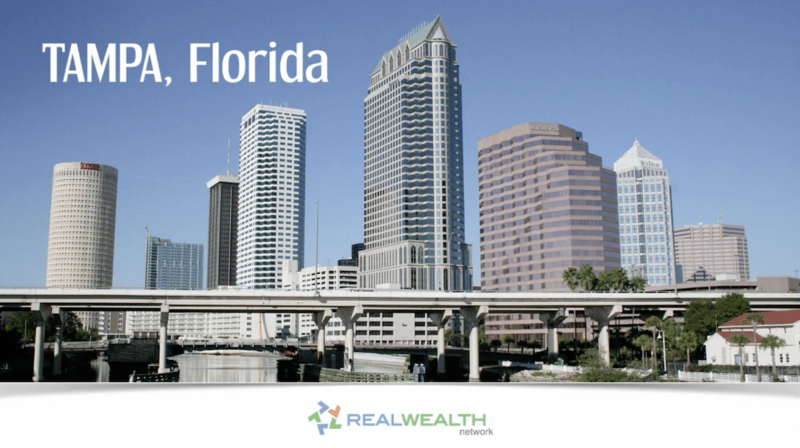 The area has numerous strong Fortune 500 companies including Publix Super Markets Inc., Jabil Circuit Inc., and WellCare Health Plans, Inc.
Tampa remains a fantastic tourism market and one of the best cities to buy real estate. It’s a popular option for retirees as well, providing for many short-term rental opportunities. 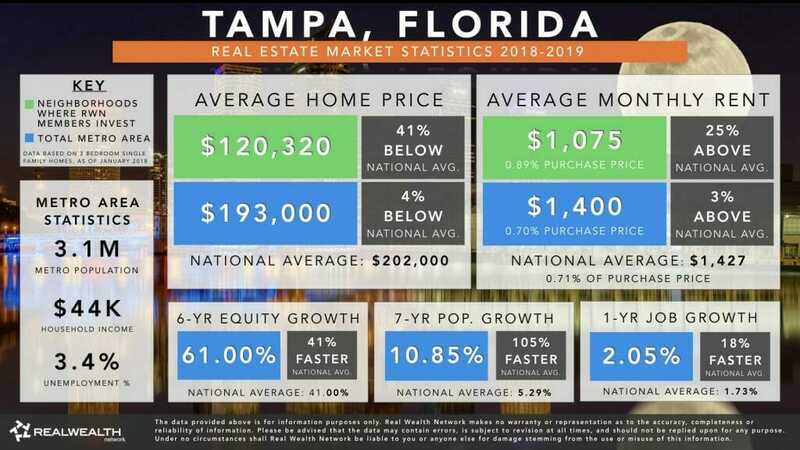 Population Growth: Tampa has a population of 3.1 million, a local economy worth over $130 billion, and the it’s ranked in the top 20 fastest growing metros in the United States. Affordability: An area with mostly high-priced homes, Tampa still has pockets where investors can find homes at affordable prices, even as low as $120,000 and turn around to rent them for $1,075 a month to $1,400 a month, above the national average. In the past 7 years, the Jacksonville metro area has grown by 11.55%. To date there are 1.5 million people living in this area, and more continue to come every year. In fact, Jacksonville’s population has been steadily increasing at a rate of about 2% per year, and their workforce is growing at a consistent rate as well. There are many reasons for this growth. For starters, Jacksonville is also the only Florida city that is home to four Fortune 500 companies. The region also has a world-class health care system, with more than 20 hospitals and a growing bioscience community. Additionally, 13 of Forbes Global 500 have operations in Jacksonville. 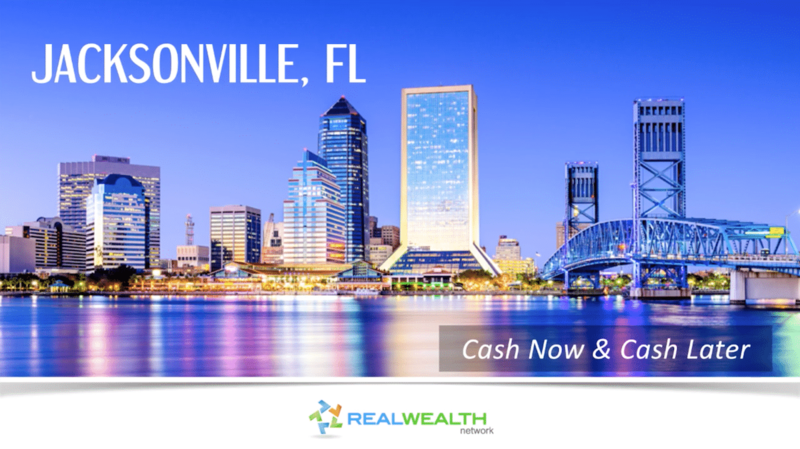 With a cost of living below the national average, a wonderful climate and a business-friendly environment, we believe Jacksonville is one of the best real estate investment markets in the country right now. The population in Jacksonville has grown 24.1% in population since 2000, which is higher than Miami’s 16.4% and Tampa’s 19.8%. Future job growth in Jacksonville is predicted to be 39.21% over the next 10 years. In Jacksonville, the median home price is about $171,000, which is 15% less than the national average. A typical 3 bedroom home can rent for 15% more than the national average. The expansion of the Panama Canal is helping to bring jobs into the Jacksonville area ports. This is likely to lead to even more population growth. The Jacksonville metro also has a world-class health care system, with more than 20 hospitals and a growing bioscience community. There are three main reasons that Jacksonville made our list of the best places to invest in property: job growth, population growth and affordability. Job Growth: Forbes also ranked Jacksonville #3 on their list of best cities in the U.S. for jobs with a growth rate of 3.16% this year. The region also has a world-class health care system, with more than 20 hospitals and a growing bioscience community. Population Growth: The population in Jacksonville has grown 24% since the year 2000, and continues to grow by an average 2% annually. Future job growth over the next ten years is predicted to be 39.21%. 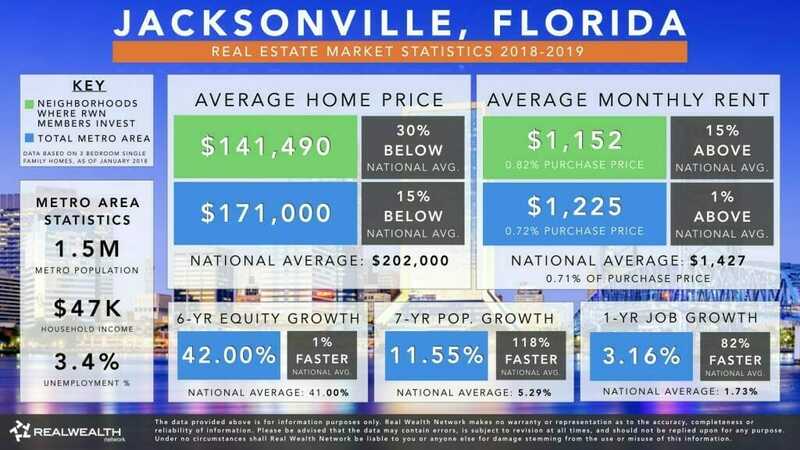 Affordability: In Jacksonville, the median home price is about $171,000, which is 15% less than the national average. A typical 3 bedroom home can rent for 15% more than the national average. These factors show us that there’s a strong opportunity for cash flow in the Jacksonville metro. With a population of over 2.3 million, the Pittsburgh Metro area is the 22nd largest in the nation. The “Burgh” is known as “The City of Bridges” for its 446 bridges, and “The Steel City” for its former steel manufacturing base. It’s the home of several large corporations that help to keep its moderate and growing economy stable including PNC Financial Services and Federated Investors. Its economy thrives on healthcare, education, technology, robotics, financial services, glass, and more recently film production (The Dark Knight Rises was filmed downtown). It is ranked as one of the top 12 places to invest by the Pittsburgh Post Gazette. It’s also one of the top 10 housing markets for redevelopment and growth. Plus, according to RentRange rents for single-family homes rose 12.6 percent and the average gross yield was over 15 percent! That’s of course why we believe Pittsburgh is one of the best places to buy rental homes this year. The median sale price of 3 bedroom single family homes in Pittsburgh remains low at only $141,000. However, in some neighborhoods it is possible to purchase homes for less than $73,000. Median rent per month is $1,115 a month or 0.79% of the median purchase price, which provides an opportunity for a sizable and quick return. The area is also seeing steady rise in home value with over 21% equity growth over the last 6 years. Pittsburgh has been experiencing steady job growth in the education and health services, leisure and hospitality, professional and business services, and STEM sectors. Pittsburgh is also home to 15 Fortune 500 companies, the East Coast headquarters for Google, and many other high tech startups. Business Times ranks Pittsburgh as the #1 top city to relocate to & Zillow ranked it in the top 10 best housing markets in the nation. Job Growth: Pittsburgh has not been creating as many jobs as other U.S. cities, however the metro area is experiencing employment gains in several sectors. For example, between September 2015 and 2016, there were 6,773 jobs created in the education and health services, leisure and hospitality, professional and business services, and STEM sectors. However, 6,447 jobs were lost from goods-producing industries, which created close to the net decline in employment for the metro area. All of this data shows us that demand in Pittsburgh is still rising at a steady rate among some “high-value” demographics, including millennials and people in STEM fields. Population Growth: Pittsburgh’s overall population has declined since 2010 but the millennial population has grown significantly. In fact, in a 2018 study conducted by Niche, Pittsburgh ranked #12 for best cities for millennials. This is a good sign for investors because millennials often prefer renting to buying (in 2017, homeownership for millennials is less than 13% nationwide), which means the demand for rental homes in Pittsburgh will likely rise in the coming years. 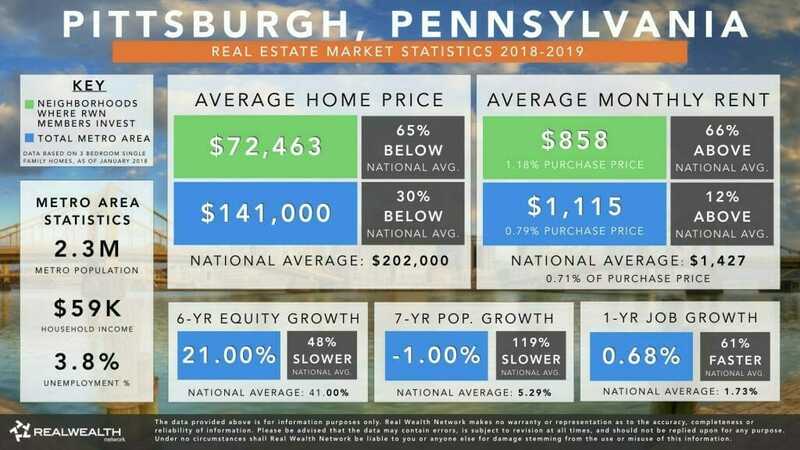 Affordability: The median sale price of 3 bedroom single family homes in Pittsburgh remains low at only $141,000, which is 30% less than the national average of $202,000. Huntsville is also well known for its technology, space, and defense industries. The top employer is the military with over 31,000 jobs at Redstone Arsenal. NASA Marshall Space Flight Center is the next largest employer. The city is also home to several Fortune 500 companies, which provide a broad base of manufacturing, retail, and service industries to the area. The Huntsville/ Montgomery real estate market offers great opportunities for investors today. It’s one of the nation’s most affordable investment markets, it has a steady job market that offers STEM workers higher than average salaries, and a growing population (38% of whom are renters). These are good signs for investors interested in generating passive monthly income. Huntsville is home to several prestigious Southern universities, including Alabama A&M University, Oakwood University and the University of Alabama in Huntsville. The U.S. Space & Rocket Center, Alabama’s top paid tourist attraction and the earth’s largest space museum, is also located in Huntsville. Huntsville is well known for it’s technology, space, and defense industries. The top employer is the military with over 31,000 jobs at Redstone Arsenal. NASA Marshall Space Flight Center are the next largest employers. Both cities are also home to several Fortune 500 companies, which provide a broad base of manufacturing, retail and service industries to the area. Huntsville continues to lead the growth in Alabama. In the last seven years the population has grown over 8%, which is 63% faster than the national average. Huntsville enjoys lower tax rates and high rents, which increase ROI. And since the average home price is approximately $151,000, these areas won’t break your bank account either. Job Growth: Huntsville is well known for it’s technology, space, and defense industries. The top employer is the military with over 31,000 jobs at Redstone Arsenal. NASA Marshall Space Flight Center are the next largest employers. The city is also home to several Fortune 500 companies, which provide a broad base of manufacturing, retail and service industries to the area. Population Growth: Over the last 7 years, Huntsville’s population has increased 8.62%. During the same period, the national population grew by only 5%. This shows us that people are moving to Huntsville at a higher rate than most other cities across the United States. 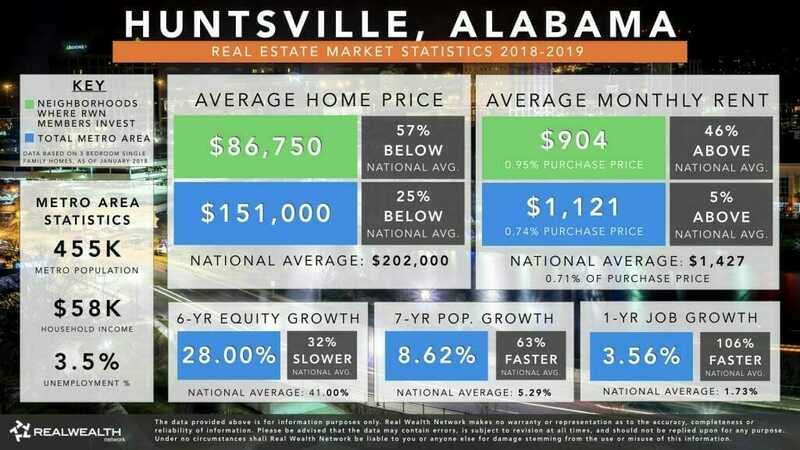 This type of population growth, when coupled with affordable real estate prices and job growth, is a positive indicator that the Huntsville real estate market is strong. Learn more about job growth in the next section. 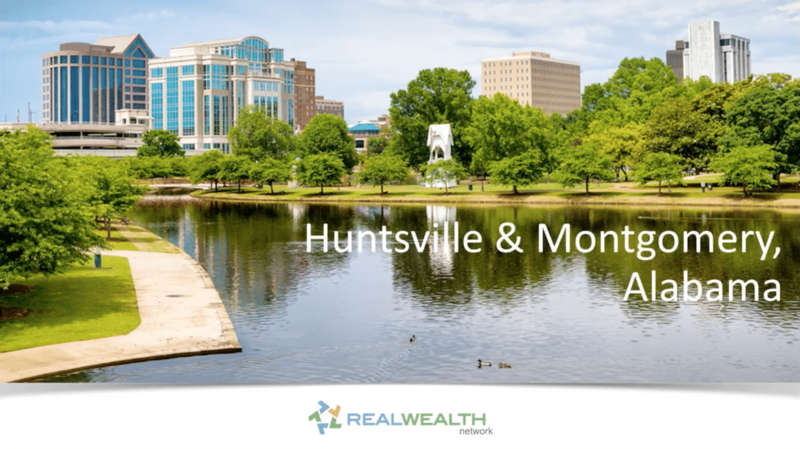 Affordability: Montgomery and Huntsville enjoy lower tax rates and high rents (rent per month is $1,121 or 0.74% of the median purchase price), which increase ROI. And since the average 3 bedroom single family home price is approximately $151,000, 25% lower than the national average. When then-President of the Republic of Texas, Sam Houston, incorporated the City of Houston in 1837, the prevailing industry was railroad construction. A lot has changed since then, but the city’s passion for modes of transportation has not. Hint: Houston is the home of NASA’s Mission Control and a lot of oil money. Houston is also home to 49 Fortune 1000 companies, which is the second largest concentration of any other city in the country, behind only New York with 72. In addition, the largest medical center in the world, The Texas Medical Center, is located in Houston and gets an average of 7.2 million visitors per year. To date, there have been more heart surgeries performed here than anywhere else in the world. Houston is a stable, landlord friendly market that offers both cash flow and equity growth. And you can STILL acquire properties well below their replacement value. Houston offers investors a strong opportunity to generate passive monthly income. In January 2018, the median monthly rent for three bedroom homes in Houston was $1,440, which is 0.91% of the purchase price of $159,000. This is higher than the national price-to-rent ratio of 0.74%. Houston home values have been rising faster than other U.S. real estate markets. In January 2012, the median price of three bedroom homes in Houston was $104,000. Over the next six years (Jan. 2012 to Jan. 2018), three bedroom homes in Houston appreciated by 36.70%. Houston was ranked the #10 best city for young entrepreneurs by Forbes and the #2 best place to live in the world by Business Insider. Job Growth: It’s currently at, or near the top for job growth in the U.S and the cost of living is well below the national average. Population Growth: Since 2012, Houston’s population has increased 15.87%. During the same period, the national population grew by only 3.93%. 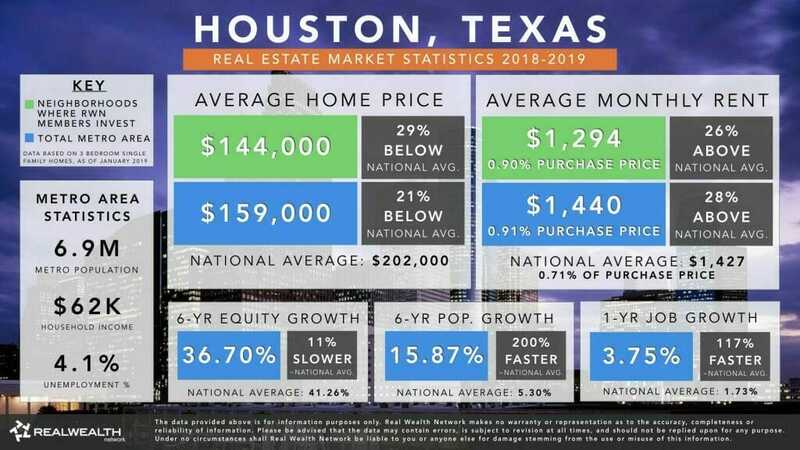 This shows us that people are moving to Houston in greater number than most other American cities, which is a positive indicator of a strong real estate market. Affordability: In 2018, the median price of three bedroom homes in Houston was $159,000. This is 21% lower than the national average of $202,000. 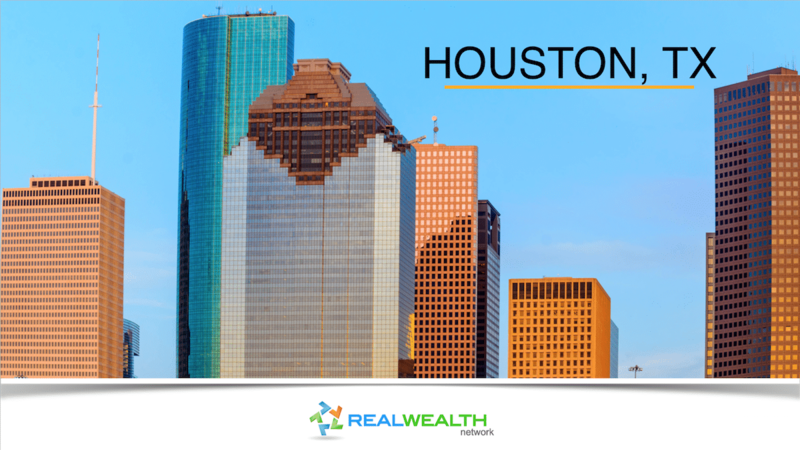 Houston also offers investors a strong opportunity to generate passive monthly income. In 2018, the median monthly rent for three bedroom homes in Houston was $1,440, which is 0.91% of the purchase price of $159,000. This is higher than the national price-to-rent ratio of 0.74%. 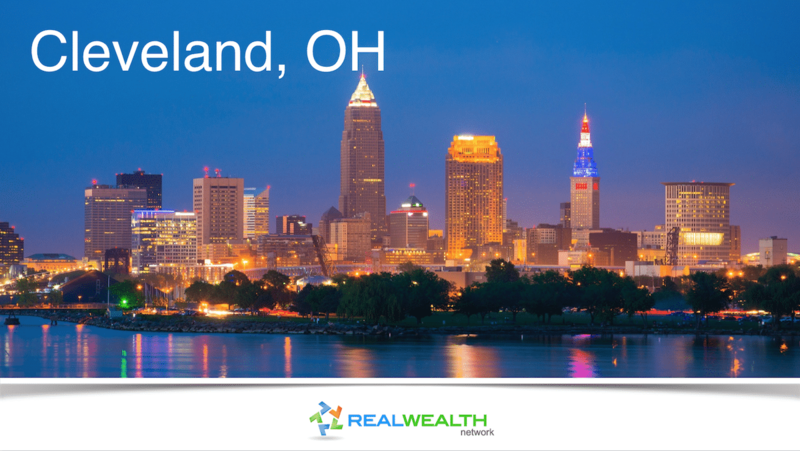 Cleveland is one of the strongest markets in the nation, offering investors high cash flow and future growth. With a workforce of over 2 million people, Cleveland has the 12th largest economic region in the nation. The number of people moving to downtown Cleveland has also gone up 77% from 2000 to 2015—the largest population increase of any Midwest city (including Chicago), according to Brookings. And the pace is picking up, with an all time high of 15,000 moving downtown just last summer, mostly comprised of the coveted Millennials (ages 18-34). This demographic shift is referred to as the “brain gain,” since there’s been a 139% rise in the number of young residents with bachelor’s degrees. Why? Downtown Cleveland has experienced a renaissance over the past several years, with an estimated $19 billion in development completed or planned since 2010. Just in the last two years, a 10-acre green space downtown was redesigned and has quickly become a gathering place for locals and tourists. The $50-million project is just one of many, including commercial and residential real estate developments. Fastest growing healthcare economy in U.S. (and home to world renowned Cleveland Clinic). Nation’s first Global Center for Health and Innovation as well as a new medical convention center. 10 Fortune 500 company headquarters (Goodyear Tire, Cliffs, Natural Resources, Firstenergy, Sherwin Williams, Eaton Corporation, Travel Centers of America, Aleris, Parker Hannifin, Progressive Insurance, KeyCorp). Has the 2nd largest live theater district in the U.S., second only to New York City. Home to three major sport teams that bring billions of dollars to the area every year. Job growth continues to steadily rise at 2.12%, 23% faster than the national average. Job Growth: Cleveland has a fast-growing healthcare and tech sector. Millennials are moving into the area at a rapid pace to take advantage of the job opportunities available at Cleveland companies, including The Cleveland Clinic, Eaton Corporation, and Key Corp.
Population Growth: The number of people moving to downtown Cleveland has also gone up 77% from 2000 to 2015—the largest population increase of any Midwest city (including Chicago) and far above the regional average (7.7 percent), according to Brookings. And the pace is picking up, with an all time high of 12,500 moving downtown just last summer, mostly comprised of the coveted Millennials (ages 18-34). 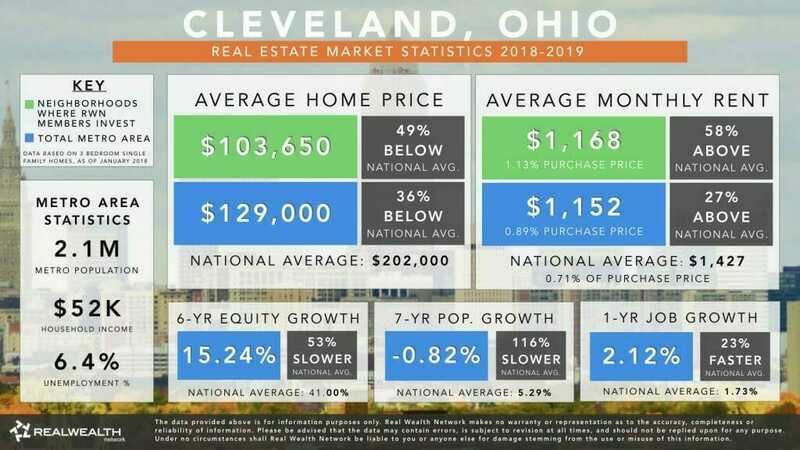 Affordability: In Cleveland it’s still possible to purchase single family homes at a fraction of their mid-2000 prices. For example, in good B neighborhoods homes sell for $70,000 – $85,000 and rent for $800 – $1000/month. This means there’s a good opportunity for cash flow and appreciation in this market. And that’s great news for real estate investors in 2019. 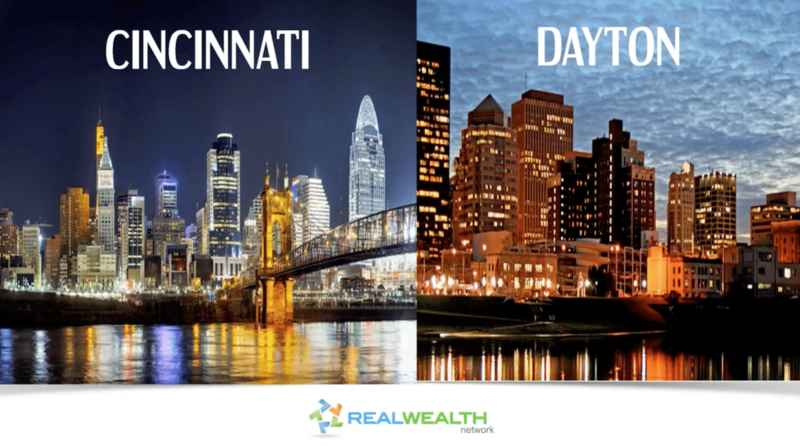 With a population of 2.2 million, Cincinnati is part of the 24th largest U.S. metropolitan area and it is growing fast! Both Cincinnati and neighboring city, Dayton, are rapidly coming together in a rush of housing, retail and commercial development across Warren and Butler counties. According to CNBC, a recent study ranked Cincinnati as one of 15 city’s attracting the most millennials in 2018 with over 12,000 new residents. According to the Brookings institution, the Cincinnati/Dayton area is among the nations 25 fastest developing regions. Yet the cost of living and the cost of housing are still well below the national average, making this an affordable and attractive place to live. 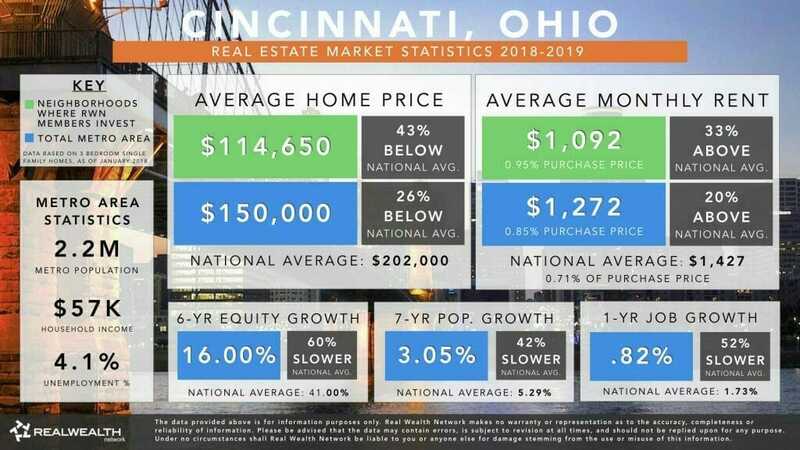 In 2018, the median monthly rent for three bedroom homes in Cincinnati was $1,272, which is 0.85% of the purchase price of $150,000. This is higher than the national price-to-rent ratio of 0.74%. Cincinnati has also become a popular destination for new and relocating corporate headquarters, including 10 Fortune 500 companies and 17 Fortune 1000 companies. All of these are good signs for investors that are looking to invest in cash flow property with a strong chance of appreciation. The area is among the nation’s 25 fastest developing regions and since 1990 the county’s population has increased by 14%. A $350 million retail complex opened in 2018. Cincinnati/Dayton is the country’s 4th largest inland hub. The area is 4th in the US in new facilities – including GE Aviation’s new 420,000 square-foot Class A office campus and a new 80,000 sq ft Proton Therapy Center for cancer research. Cincinnati has also completed a $160 Million dollar campus expansion. In 2018, the median monthly rent for three bedroom homes in Cincinnati was $1,272, which is 0.85% of the purchase price of $150,000. This is higher than the national price-to-rent ratio of 0.74%. Cincinnati was just named as one of the best markets for real estate investments in 2019 by Forbes. Job Growth: The Cincinnati metro area has the 4th largest number of new facilities in the U.S. – including GE Aviation’s new 420,000 square-foot Class A office campus and a new 80,000 sq ft Proton Therapy Center for cancer research. Population Growth: The area is among the nation’s 25 fastest developing regions and since 1990 the county’s population has increased by 14%. With a cost of living that is 11.4% below the national average, this trend will likely continue. Affordability: In Cincinnati it’s still possible to purchase fully renovated cash flow properties in good neighborhoods for $80,000 to $150,000. 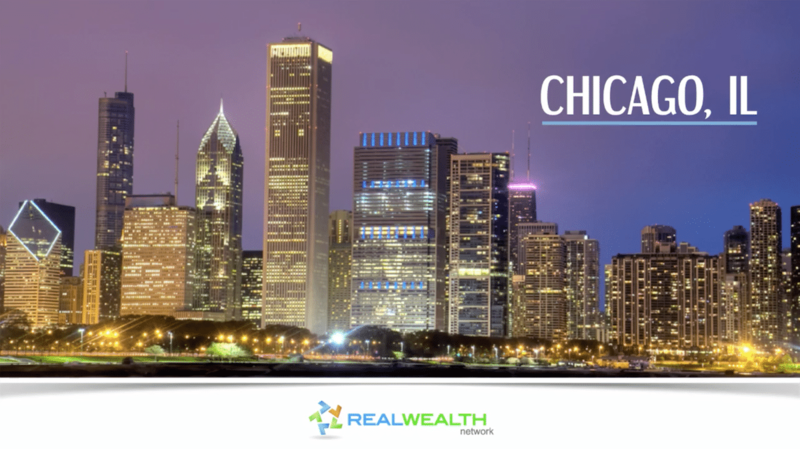 Known for its towering skyscrapers and Fortune 500 companies, the Windy City is one of the few remaining U.S. markets where you can still find great investment opportunities. Real estate prices have soared within Chicago’s city limits, causing people to move out of the city and into the suburbs. As a result, prices in some of these neighborhoods have increased by 14%+ in 2017 alone. Yet property in the area is still undervalued…You can purchase fully renovated rental homes from $80,000 to $196,000 that you rent for .79% (above national average) of the purchase price! 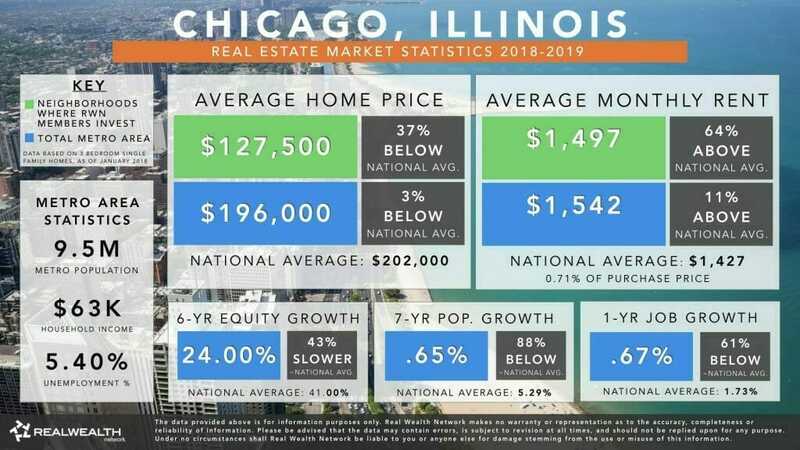 All of these factors indicate that Chicago is great news for investors looking to buy income property with high cash flow and strong potential for appreciation. Good news for investors: Chicago is one of the last markets where housing prices have not yet risen past their 2006 levels, simply due to the state’s tough foreclosure laws. 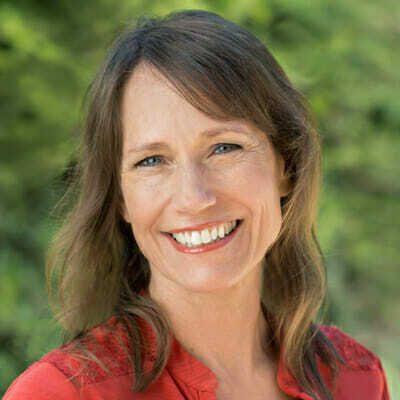 Savvy investors are taking advantage of the situation and are still able to acquire income property at bargain prices. Chicago is the 3rd largest city in the United States and the 4th most economically powerful city in the world. It’s still possible to find homes for sale in mid-level markets in the range of $127,500 to $160,000. The median sale price for a home here is $196,000. In some neighborhoods you can still purchase fully renovated rental homes for as low as $80,000 to $196,000 that you rent for .79% of the purchase price! The median rent in the Chicago metro area is over $1552 per month. 57% of the population rents, which is 24% higher than the national average. 83% of Chicagoans live in a home for 1 year or more. Chicago is home to 30 Fortune 500 companies and boasts a $500 billion GDP, which is more than that of Norway and Belgium combined! Job Growth: Chicago is the 3rd largest city in the United States and the 4th most economically powerful city in the world. There are 30 Fortune 500 companies headquartered in the metro area, which boast a $500 billion GDP. This is more than that of Norway and Belgium combined! Population Growth: Real estate prices have soared within Chicago’s city limits, causing people to move out of the city and into the suburbs. As a result, prices in some of these neighborhoods have increased by 14%+ 2017 alone. Affordability: Chicago is one of the last markets where housing prices have not yet risen past their 2006 levels, simply due to the state’s tough foreclosure laws. The median sale price for a home in Chicago is $196,000, but it’s still possible to find homes for sale in mid-level neighborhoods between $127,500 and $160,000. The median rent in the Chicago metro area is also over $1552 per month. This means there are great opportunities for cash flow in Chicago, and a strong chance of appreciation too. With a metro area of over 2.1 million people, Indianapolis is the 2nd largest city in the Midwest and 14th largest in the U.S. The city has poured billions of dollars into revitalization and now ranks among the best downtowns and most livable cities, according to Forbes. Housing costs and the annual cost of living in Indianapolis are also well under the national average. Indy also has a strong, diverse job market, great schools and universities, and plenty of sports attractions. In 2018, the median monthly rent for three bedroom homes in Indianapolis was $1,208, which is 0.84% of the purchase price of $143,000. This is higher than the national price-to-rent ratio of 0.74%. 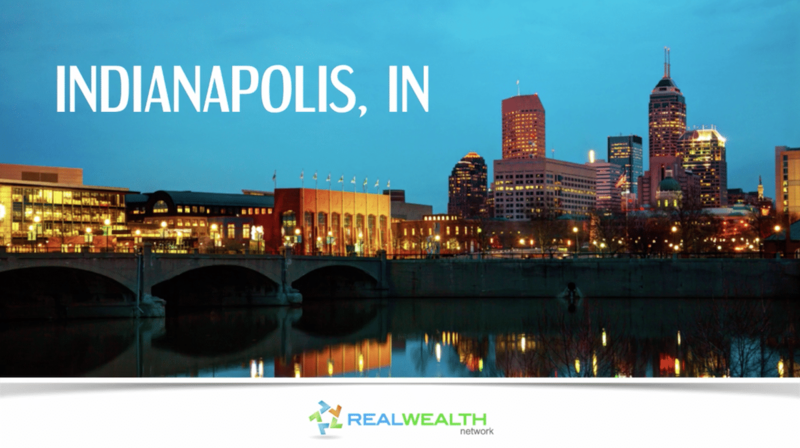 What do all of these factors tell us about the real estate market potential in Indianapolis? Let’s just say it’s a good time to become a landlord in Indianapolis. Bonus: you can purchase turn-key properties for only $60,000 – $120,000. (Turn-key means the properties are fully renovated to like-new condition, leased to a quality tenant, and excellent property management in place). 3 Fortune 500 Companies have their headquarters in Indianapolis. 7 high-tech “Certified Technology Parks” with tax incentives to start-ups. Major distribution hub including Fedex, Celadon Trucking, Amazon, Target. Indy is the ONLY U.S. metropolitan area to have specialized employment concentrations in all five bioscience sectors evaluated in the study: agricultural feedstock and chemicals; bioscience-related distribution; drugs and pharmaceuticals; medical devices and equipment; and research, testing, and medical laboratories. Job Growth: Indianapolis is one of the fastest growing hubs for technology, bioscience and Fortune 500 companies in the nation. In fact, Indy is the ONLY U.S. metropolitan area to have specialized employment concentrations in all five bioscience sectors evaluated in the study: agricultural feedstock and chemicals; bioscience-related distribution; drugs and pharmaceuticals; medical devices and equipment; and research, testing, and medical laboratories. Population Growth: With a metro area of over 2.1 million people, Indianapolis is the 2nd largest city in the Midwest and 14th largest in the U.S. Since 1989 Indy’s population has grown over 36%, and continues to grow at a rate of 1% annually. Affordability: Indianapolis is among the few U.S. cities where you can purchase turn-key properties for only $60,000 to $120,000. 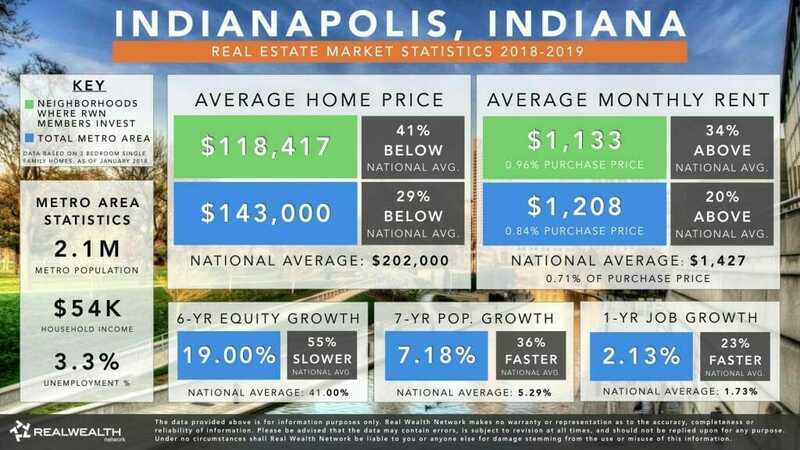 In 2018, the median monthly rent for three bedroom homes in Indianapolis was $1,208, which is 0.84% of the purchase price of $143,000. This is higher than the national price-to-rent ratio of 0.74%. Kansas City, widely known for its sports, art and culture, is also of the most affordable cities in the U.S. Since 2010, the population in the metro area has increased by 6.15%, totaling 2.1 million people. More so, the area’s gross regional product grew 2.9% in 2014, which is higher than the national average of 2.2%. Kansas City has become an important sector for healthcare, IT, manufacturing, and the auto industry, adding some 18,100 jobs between August 2017 and August 2018. This economic and population growth is impressive. 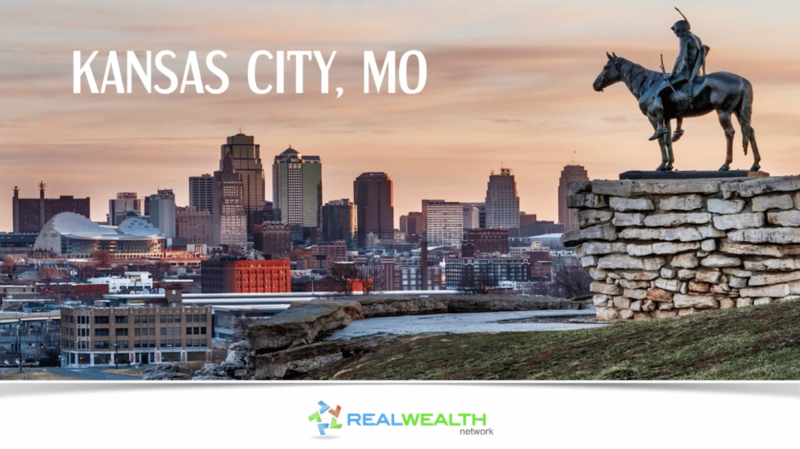 Good news for investors: in recent years, many Americans have been following companies/jobs to “less expensive” cities, including Kansas City. The result: these affordable markets are seeing a steady increase in rental demand. This means it’s a very good time to be a Kansas City landlord. Kansas City has become one of the hottest spots for renters, which in turn has increased demand for more available homes and apartments for rent. There is a large number of affordable homes on the market including pre-foreclosure and bank-owned properties priced around $100,000 to $120,000. The average list price here is $162,000. Average monthly rent sits around $1,275 a month. The median household income here is about $45,000. Employment continued to increase by 1.67% in 2018, adding some 18,100 jobs. Job Growth: Kansas City has become an important sector for healthcare, IT, manufacturing, and the auto industry, adding some 18,100 jobs just last year. This economic and population growth is impressive. Population Growth: In recent years, many Americans have been following companies/jobs to “less expensive” cities, including Kansas City. Since 2010, the population in the metro area has increased by 6.15%, totaling 2.1 million people. 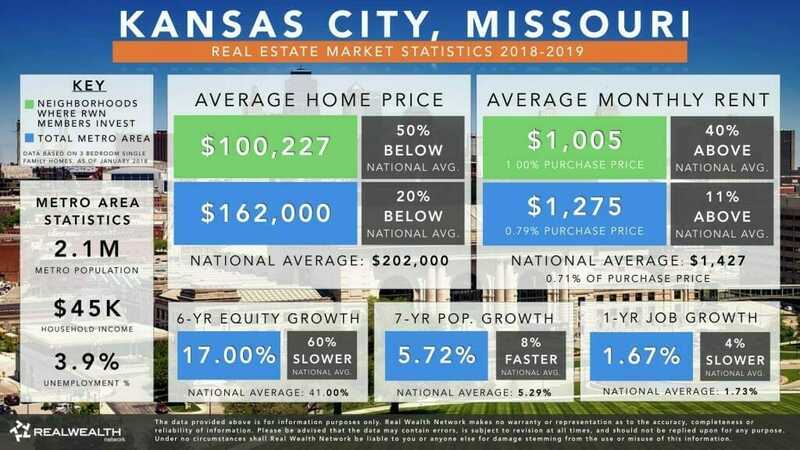 Affordability: The average list price in Kansas City is $162,000. However, the metro area has a large number of affordable homes on the market, including pre-foreclosure and bank-owned properties priced between $100,000 to $120,000. The average monthly rent sits around $1,275 a month. Detroit, the largest city in the state of Michigan, is recognized as the automotive capital of the world, which has earned it the nickname “Motor City.” The metro area is home to General Motors, Ford Motor Company, Chrysler (“The Big 3” major automotive companies in the U.S. and Canada), which offer a wide-range of jobs and invest billions of dollars into the city’s infrastructure. Detroit is also home to 100 Fortune 500 companies, including Penske Automotive, Quicken Loans, Kellogg, Whirlpool, and Walmart. Despite its longstanding nickname, several of Detroit’s fastest growing industries are in sectors as diverse as healthcare, defense, aerospace, IT and logistics. Billionaire Dan Gilbert (the chairman and founder of Rock Ventures and Quicken Loans Inc, as well as the majority owner of the National Basketball Association’s Cleveland Cavaliers, the American Hockey League’s Cleveland Monsters, the Arena Football League’s Cleveland Gladiators and the NBA Developmental League’s Canton Charge) has moved numerous companies to Detroit, investing over $1.6 Billion in the Detroit area. Major Attractions include Detroit Tigers, Detroit Lions, Detroit Red Wings, Wayne State University, University of Michigan, Beaumont Hospital, Fox Theater and a new bridge to Canada being built. 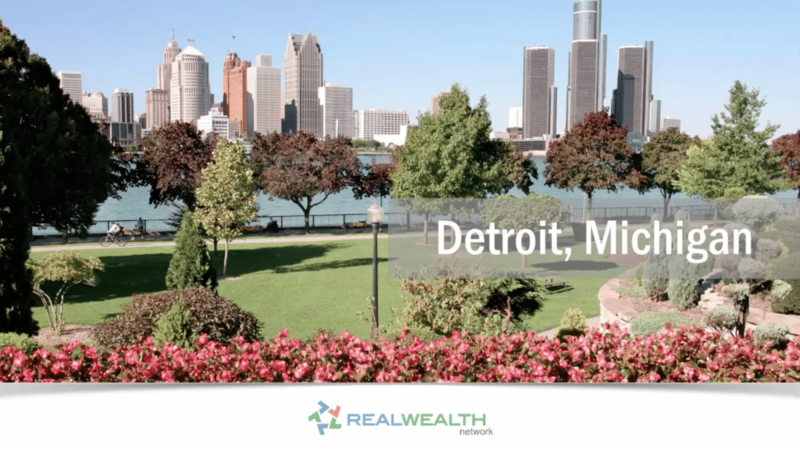 Our Real Wealth vetting team took a trip out to Detroit last month to see what’s happening there and to find out why investors are jumping back into that market. We were shocked at what we found! Downtown Detroit is being totally revitalized with billions of dollars of real estate and construction activity. Plus, many of the dilapidated foreclosures were torn down. We found an excellent team in Detroit who finds discounted properties, fixes them to like-new condition and offers ongoing properties management. Somehow they are able to keep the price points down for a fully turnkey property to around $80,000. Gross yields are closer to 16%! 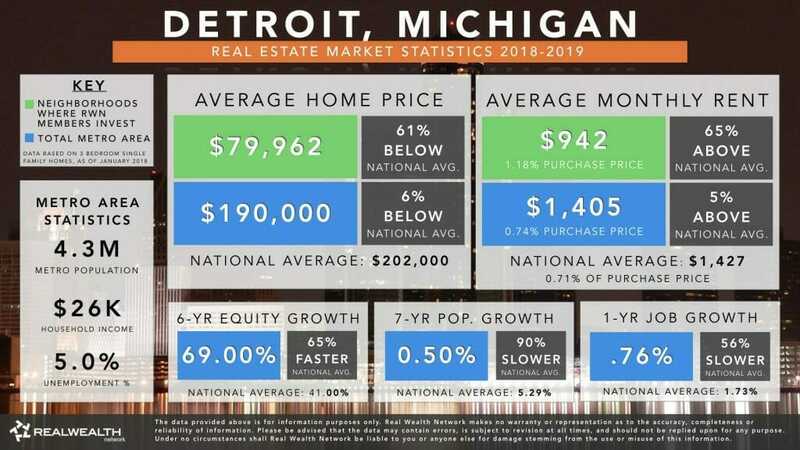 This is why we believe Detroit is one of the best places to invest in rental property this year. The Michigan Business Development Program provides grants, loans, and other economic assistance to businesses. Michigan has a flat 6% corporate income tax, which is the lowest in the nation. Personal income tax is also among the lowest in the nation at 4.25%. Michigan also has a lower cost of living than any other Midwestern state. Since 2010, more than 45,000 automotive manufacturing jobs have been added to the Detroit Metro, which is more than any other area in the nation. Job Growth: According to the U.S. Bureau of Labor Statistics, the employment rate in Detroit increased by 2% between September 2015 and September 2016. During the same period, the national job count increased by only 1.7%. Population Growth: People have been following companies/jobs to “less expensive” cities. For example, Billionaire Dan Gilbert (the chairman and founder of Rock Ventures and Quicken Loans Inc, as well as the majority owner of the National Basketball Association’s Cleveland Cavaliers, the American Hockey League’s Cleveland Monsters, the Arena Football League’s Cleveland Gladiators and the NBA Developmental League’s Canton Charge) has moved numerous companies to Detroit, investing over $1.6 Billion in the Detroit area. Affordability: In Detroit you can purchase a fully renovated rental property in good B neighborhoods for only $65,000, and rent them for about $900/month. Plus, these properties used to sell for over $100,000 so there’s a good chance values will increase as well. Located in the low foothills of the Appalachian Mountains, Atlanta is the third-largest metropolitan region in the Southeast, behind the Greater Washington and south Florida areas. For decades, the Atlanta metro area experienced rapid growth, which attracted families from all over the southern United States as well as the Midwest. The population grew close to 4% annually to match the demand of new jobs – many of them in the high-paying sectors, including manufacturing. Today, Atlanta’s growth has slowed a bit, but not entirely. Between 2017 and 2018, 3 bedroom single family homes in the Atlanta metro appreciated by a median 9.27%. This is 1.25% higher than the national average of 8.02%. Over a 6-year period, median appreciation reached 66%, which is 60% faster than the national average. During the same period, rents for 3 bedroom single family homes in Atlanta appreciated by an average 4.76%. Over the past 7 years, Atlanta’s population grew by 10.95%, which is 107% faster than the national average of 5.29%. In the last year, 53,700 new jobs were created in Atlanta – an annual growth rate of 1.96%. This is a higher rate than the national average of 1.73%. Job Growth: In the last year, 53,700 new jobs were created in Atlanta – an annual growth rate of 1.96%. This is a higher rate than the national average of 1.73%. Population Growth: Over the past 7 years,, Atlanta’s population grew by 10.95%, which is 107% faster than the national average of 5.29%. 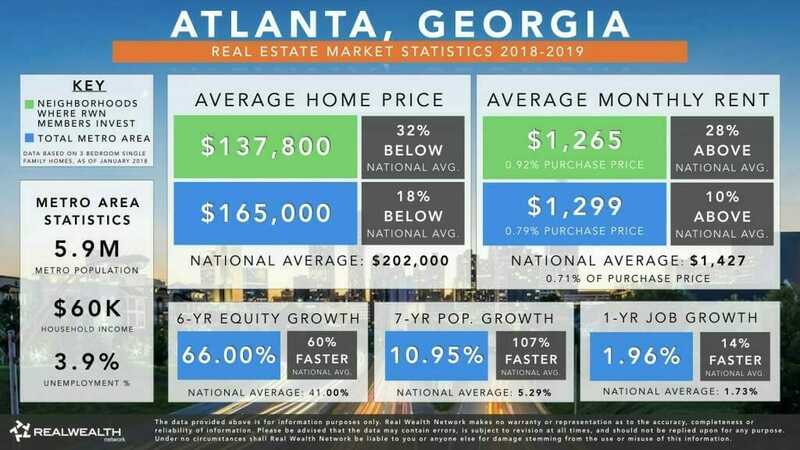 Affordability: In 2018, the median purchase price of 3 bedroom single family homes in the Atlanta area was $165,000. This is 18% lower than the national average for 3 bedroom homes. This is great news for real estate investors in 2019. Columbus is the capital of Ohio, the county seat of Franklin County, and the largest city in the state. In recent years, this city has emerged as one of the nation’s most technologically sophisticated cities — it is home to the Batelle Memorial Institute, the world’s largest private research and development foundation, and Ohio State University, the nation’s third-largest university campus. Columbus also offers great opportunities for investors today. This is especially true for those who are looking for an affordable investment, strong monthly cash flow, and a good chance for equity growth. Columbus is affordable. 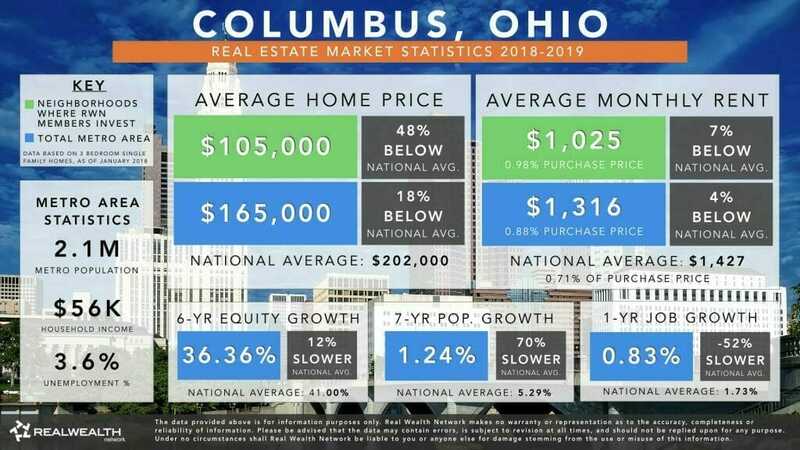 In 2018, the median price of three bedroom homes in Columbus was $165,000. This is 18% lower than the national average of $202,000. It’s possible to rent single-family homes in Columbus for as much as 0.98% of the purchase price. This is well above the national average of 0.71% (2018). Columbus is the 14th largest city in the country. Over the last seven years, Columbus’ metro population has grown 9%, faster than the national average of 5.29%. Realtor.com ranked Columbus as the fourth-hottest housing market in the country. Business Week named Columbus among the best cities to live and work in America. Job Growth: Columbus has added over 9,000 new jobs between 2017 and 2018. Although this statistic indicates a slowdown in new jobs, the growth rate continues to hold steady. Population Growth: Columbus’ population has grown over 9% in the last seven years, faster than the national average of 5.29%, and remains the 14th largest city in the country. Affordability: In Columbus it is still possible to purchase fully renovated properties in good neighborhoods for less than $100,000. Milwaukee is one of the top 50 markets in the country for the coveted millennial renter. More than 80% of current tenants are millennials. This is primarily because of close proximity to employment, retail and recreation hubs. The number of unemployed in the metro area fell by 4,200 over the past 12 months (January, 2016 to January, 2017) to 34,300, a 10.9 percent decline from year-ago levels. The number of new unemployment compensation claims in metro Milwaukee numbered 5,748 for January, down 5 percent from one year ago. Metro Milwaukee’s unemployment rate for January fell to 4.2 percent (seasonally unadjusted), down 0.5 percentage points from one year ago. Also, the average time on rental market is 14 days and investor clients are getting between 7-10 net CAP rates. Additionally, median prices in Milwaukee have steadily increased over 7% annually the past three years according to data provided by Milwaukee Metro MLS. Investing in Milwaukee real estate is a wise cash flow and appreciation investment strategy. Properties available are attractive rates of return. Rents are commonly above 1% of purchase price. 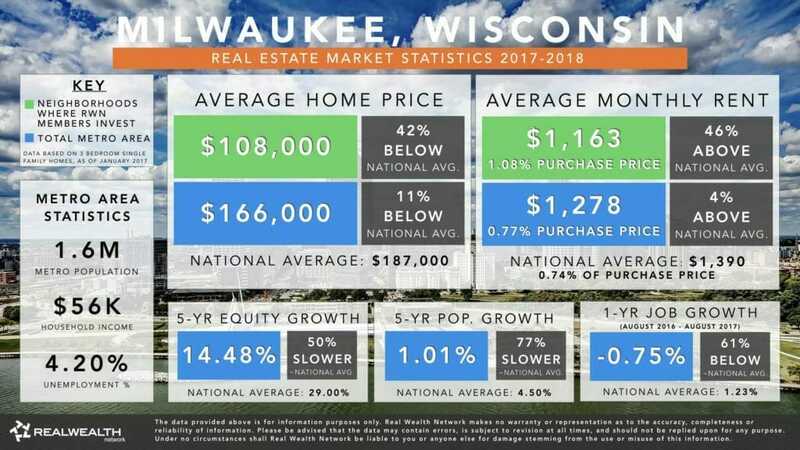 Based on the numbers above it may not seem like Milwaukee is a good place to invest in real estate in 2019. However, there are many promising signs that indicate the Milwaukee area is about to boom. These signs include billions of dollars in investment, an influx of educated millennials flocking to the downtown area, an up-and-coming culinary and craft beer scene, and much more. Home to over 2.8 million people, the St. Louis metro area is the 21st largest metro in the country. It’s also one of the most stable and affordable real estate markets today where investors can purchase single family homes for as little as $120,000 and rent them for just under 1% of the purchase price. St. Louis is popular among real estate investors because of its stable economy, growing technology hub, large metro population, and most especially, its affordable housing market. While the average home price in the St. Louis area is still below $200,000, there are many pockets of the metro area with even more affordable entry points ($120K-$130K) with monthly rent averaging $1,100-$1,200. Another positive factor for investors is that renters make up 32% of the market, which is slated to only increase as young educated millennials continue to migrate to St. Louis for its affordable housing market. St. Louis is affordable. The median price of the average three bedroom home in St. Louis is $176,000. This is 12% less than the median value nationwide. 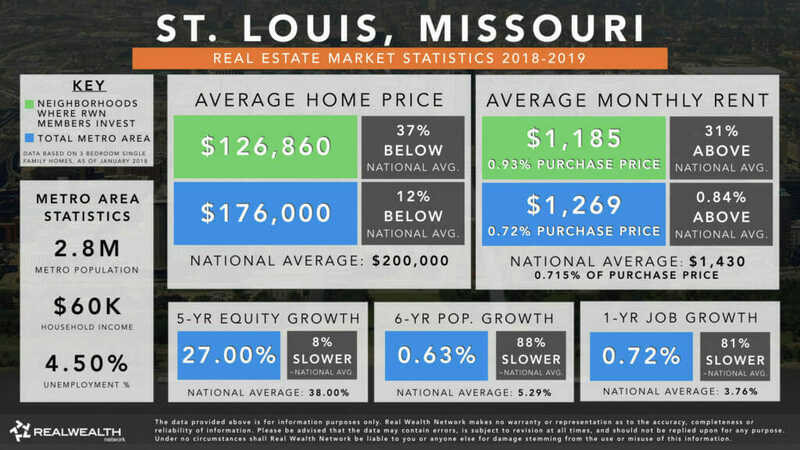 The median monthly rent of the average three bedroom home in St. Louis is $1,269, which is exactly 0.72% of the median purchase price of $176,000. Between July 2010 and July 2017, the St. Louis MSA population grew by 0.63%. Although this growth is significantly slower than the national average of 5.29%, the population is still growing. Between June 2017 and 2018, the St. Louis MSA added 9,900 new jobs – an annual growth rate of 0.72%. During the same 12-month period, over 2.4M jobs were created nationwide an annual growth of 1.64%. Job Growth: St. Louis has added over 9,900 new jobs between 2017 and 2018. Although job growth was slower than the national average over the last 12 months, it’s important to note that jobs have been created AND people have been moving to the area to claim them. In other words, slow growth is still growth. Population Growth: Since 2010, St. Louis’s population grew by 0.63%. Although this growth is slower than the national average, the population is still growing. Future growth also looks promising. Affordability: In St. Louis it is still possible to purchase fully renovated properties in good neighborhoods for under $127,000, which is 37% lower than the national average of $200,000. Located in the middle of the Rio Grande valley, Albuquerque is the most populous city in the state of New Mexico and the 32nd-most populous city in the United States. Albuquerque is at the center of New Mexico’s “Technology Corridor,” a concentration of high-tech private companies and government institutions located along the Rio Grande river. It is also home to Intel, Sandia National Laboratories, Kirkland Air Force Base and four universities. And we can expect more jobs and movies coming out of the area as Netflix plans to move their new U.S. production hub to the area. Albuquerque is affordable. The median price of the average three bedroom home in Albuquerque was $190,000 in January 2018. This is 6% less than the median value nationwide. As of October 2018, three bedroom home values have risen to a median $199,000. The median monthly rent of the average three bedroom home in Albuquerque was $1,207, which is over 0.92% of the median purchase price of $190,000. This shows us that there’s an opportunity to generate passive monthly cash flow in Albuquerque at a higher rent-to-purchase ration than the national average of 0.71%. Since 2010, the population in Albuquerque has increased by 2.38%. The national population grew by 5.29% during this 7-year period. This shows us that Albuquerque is experiencing consistent growth year after year. Between August 2017 and August 2018 the number of jobs in the Albuquerque metro increased at a rate of 1.93%. Nationally the number of jobs increased by only 1.73% during this period. Job Growth: In the last year, the number of jobs in Albuquerque has increased 11% faster than the national average. This is a good sign that more people will continue moving to the area. More people equals more demand for rental housing. And this is good news for buy and hold investors. Population Growth: Albuquerque is experiencing consistent population growth year after year. Although this growth isn’t staggering, it’s another indicator that Albuquerque’s real estate market will continue to be stable in years to come. 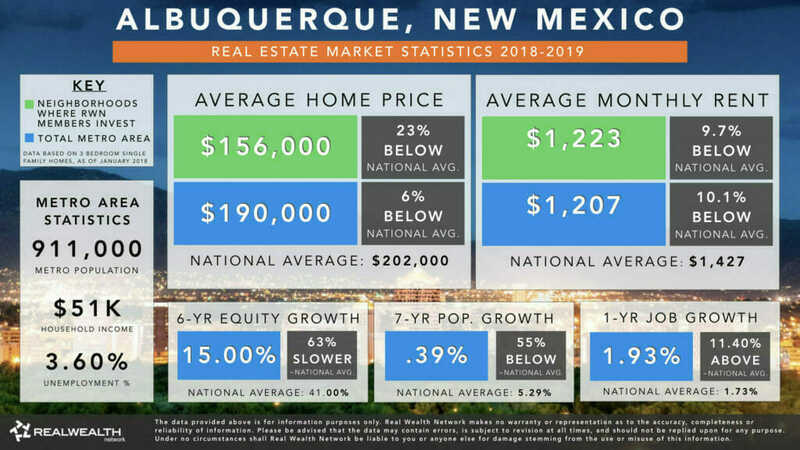 Affordability: Albuquerque home values are as much as 23% lower than the national average, which means real estate here is uniquely affordable.